A famous classic dish that we’ll cook together perfectly! 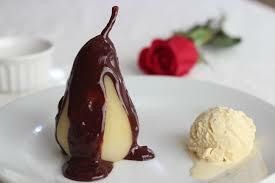 Poached fresh pear, served with vanilla ice cream and warm chocolate sauce. It doesn’t get better than this! This class also includes a recipe for Duck A L’orange.